Famed futurist Ray Kurzweil thinks tiny robots will flow through our bodies by 2030 to help us stay healthy. We now have one more reason to believe he’s right. Compelling nanobots to move through liquids such as blood has proven tricky but doable. It’s been much harder to get tiny bots to navigate dense tissues, such as those found in the eyeball, without damaging them. Thanks to a bit of design ingenuity, though, an international team of researchers has managed to create a nanobot that can do just that. The team describes how a few key design features gave their propeller-shaped nanobot that unique ability in a paper published Friday in the journal Science Advances. First, the bot is incredibly tiny, approximately 200 times smaller in diameter than a human hair. Second, a non-stick coating helps it slip through dense tissue. And finally, the inclusion of a bit of magnetic material in the nanobots makes them easy to steer with an external magnetic field. To test the nanobots, the researchers injected tens of thousands of them into a dissected pig’s eye. Using a magnetic field, they were able to direct the swarm to the retina at the back of the pig’s eye — just as they’d hoped. 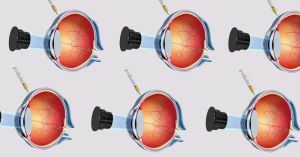 Eventually, the researchers believe this technique will allow them to deliver drugs directly to hard to reach parts of the human body — not just the back of the eyeball.